This is the story of four lucky individual’s, all avid Genesis fans and how they got to visit The Farm Studios and listen to some 5.1 surround sound remixes…. I received an email about a week before the Genesis convention of 2006, the email was from Nick Davis, to say that a guy called Steve Puddick would be in touch with me soon about a charity raffle/auction for four lucky winners to visit The Farm Studios and for them to listen to some of the 5.1 remixes. Steve did contact me, a phone call later revealed lots more information about a charity event put on at the Farnham Maltings with Genesis In The Cage performing and a prize being offered and won. Sadly the prize could not be taken up and so the winner offered the prize back to the charity. Steve and Nick asked if the Genesis convention would be interested in hosting the prize and the charity, I pointed Steve in the direction of Doug Melbourne organiser of the 2006 Genesis Convention who gladly agreed that he would be happy for Steve to be there and raise money for a good cause. On Saturday 27th May, the first day of the convention Steve and I met, where he proceeded to sell raffle tickets for a prize a trip of a lifetime. The prize being a trip to visit The Farm Studios and to listen to some remixes in 5.1 surround sound. On Sunday 28th May with the raffle closed the four winners were announced and were each handed a letter explaining the prize and the conditions and how to contact Steve. Roll on the morning of, Monday June 12th 2006 I left Coventry at an ungodly hour and I headed for the picture postcard village of Chiddingfold. It was there in the car park of The Crown Inn we waited for Steve Puddick. We got inside his people carrier and then we made our way to The Farm. On arriving at the Farm Nick Davis was slightly delayed due to other commitments, though Dale Newman was able to greet the lucky winners. Dale instantly recognised me and we got chatting, I explained to him who the lucky winners were and the purpose of the visit to The Farm. At this point Nick Davis arrived and was introduced to the four winners and Steve. The Lucky Winners and Organiser S Puddick listen intently to the surround mixes. 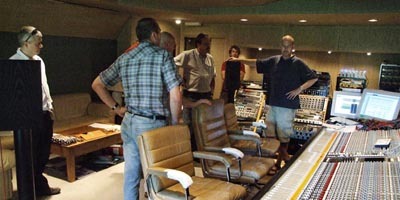 Dale proceeded to give the winners and the organiser Steve Puddick a guided tour of the studio reception room and control room home to the big SSL desk where upon he explained the history of the studio and how it came to be, taking the winners into each room and explaining its function and why it was built. Dale was asked a number of questions some of which he simply couldn’t answer, although he was able to show the lucky winners the soundboard tapes, and to explain the process that they have to undergo. He also mentioned that without Alan Hewitt’s gig guide he would have had a nightmare of a job trying to work out which show occurred on which date at said venue etc. The four were all quite amazed and enthralled as they listened avidly to Dale as he talked about the way the rooms each came to be as they are today and how everything had to be sound proofed and perfectly balanced for recording. Including the fact that some of the walls of The Farm are up to four feet thick in size and that the builders had used a product called Lignacite which is a concrete masonry block made up of saw dust, sand and cement to reinforce the walls within the old cow shed. Dale took the tour through the current control room, whilst Nick and his assistant Tom, got to work. The tour continued through to a room that had a patch bay within it so that Mike could for example plug in a guitar direct to the mixing console. Clearly visible on top of the Steinway grand piano were two guitars; one that appeared to be a black fender Stratocaster and the other, an older more prominent guitar with lots of history – this was the twin neck Microfret used on the Trick Of The Tail Tour. Dale confessed that this Microfret had been in the barn for some time, and it was recently looked at and found not to be working. He said they were trying to rectify it, with much delight. The tour continued into the Drum booth which is lined with Cotswold stone. Dale explained the various acoustics in the room and how to go about achieving different desired acoustic effects. The tour did “an about” turn and they ended up in the original control room, which contained lots of DAT tapes amongst items that had been used for the soundtrack to the picture gallery on the “Way We Walk” DVD. Some of the tour stopped to take photographs, and then they proceeded back into the lounge, at this point Dale asked everyone if they fancied a tour of the equipment barn, in a rather supersonic manner back came the reply ‘yes please’. The tour then left the control room and they followed Dale into the equipment barn. Upon walking into the equipment barn Dale explained what the mixing desk and guitars were for, his solo projects in his part of The Farm complex called “ The Scrapyard 2 “. The party of five continued into the barn with there guide Dale, at this point the lucky winners were greeted by flight cases belonging to Tony Banks and Mike Rutherford, with an odd few ones from Phil Collins and a couple of Mike and the Mechanics ones. Within the barn, for all of those keyboard fans out there, there were four Prophet 5 synthesisers, and an infamous white Hammond organ. The mere sight of these items aroused various questions of a possible reunion with the members of Genesis using their old instruments. Dale did not respond to any questions about any possible reunion except to say look on the official websites for news about the band, what Dale did say is that Tony Bank’s home studio had been revamped and refurbished hence the keyboards coming back to The Farm. Dale told the lucky winners about the original equipment barn, and what had happened when the band had decided to sell the old farm house. It was at this point Dale recruited four temporary crew to assist him in the movement of a king size bed mattress as this needed to be lifted on to a mezzanine floor. After a few more questions Dale took the party back through the scrap yard, and he generously gave away copies of his 2003 album Cubed to all of the lucky winners. The party of five were shown back into the control room of the farm, Nick introduced himself and his assistant Tom, who had gathered five chairs for the party and Nick made sure everyone was sat comfortably and he leaned over and clicked a button on the mouse to one of the computers and then Blood On The Rooftops began to play. Now bear in mind that these are the new remixes that many fans are gnashing there teeth waiting for and the lucky winners were in for a treat having a private preview. Steve Hackett’s acoustic guitar has never sounded this good before, especially during the heavier parts of this song when the lyrics and also the percussion are at there loudest, adding to this was Tony’s synthesiser at its boldest, Steve’s acoustic work was still perfectly audible, plus this version of the song was not lacking bass like the Definitive Edition Remaster of 1994. The look on the parties faces were of surprise, with a whole gamut of emotions when the final notes faded there was a pregnant pause and then Nick asked anybody did they have any questions which was followed by a stunned silence. Nick suggested to the party that they swap seating positions to gain a different perspective of the next track. Behind the lines started it was like an artic wind blasting through the room, it was after all a very hot day. This gave a fresher feel to this classic each strike on a cymbal or the high hat can be heard with such alarming clarity you’d have thought Phil was in the drum booth at The Farm. Tony’s Yamaha CP70 piano can clearly be heard throughout the entire track, Along with Phil on hand percussion which sounded like a pair of Conga’s. When this track ended Nick again looked around the room to see if there were any questions and he started the next track Dancing with the Moonlit Knight. Dear lord, Peter’s voice on this was so clear that you thought he was in the vocal booth of the farm. Steve’s electrifying work setting the scene, Phil’s drumming and high hat work perfectly audible the grand finale part of the song “There’s a fat old lady outside the saloon “was loud, powerful and clear you could hear every note, and every beat. The bass on this alone was travelling through everyone’s feet. With lots of beaming smiles, glazed eyes from memories and times past, Nick selected the final treat for the party. Dreaming While You Sleep from the beat box/drum machine start you knew you were in for a life changing experience, All of the sound effects mysteriously hidden or occluded from our ears on the original release come to life on here, Phil’s vocal effects, Tony’s percussive effects on the keyboard setting the scene of a rainy night throughout the song, Mike’s searing guitar and bass work, the bass pedals on this are immense. As the final notes faded away, the party were still in awe of what they had just experienced, Nick asked again if there were any questions, back came a few one of which everyone asked was WHEN will these be released. Nick explained that he will have finished all of the studio albums by July; he will then need to make any adjustments via recalls which should take him through to October. Nick also said he would like these items to be released soon also, but Nick did not have any idea of when and how they would be available to the public. Nick and Tom had a busy day, and everyone said there goodbyes and thank you’s on the way out I said good bye to Dale Newman, when I spotted Steve “Puddin “Jones reminiscing with him, I shook his hand and introduced myself to him. Steve was Phil’s original drum technician (After Andy Mackrill) and he has risen the ranks to touring stage manager and now the role of production manager. The lucky winners were then taken to the Chiddingfold working men’s club; here they were met by Jane the club secretary who gave the winners a brief guided tour. Hung on the wall inside was a poster of a scene that appeared in the inside of the sleeve for the album We Cant Dance, were the band look like they have attended a party and there bored and tired and miserable. They were more than happy to recreate that very scene. Spot the difference! The venue appeared far smaller than it looked on TV. Time was getting on; the party were then taken to The Crown Inn for lunch and drinks. The chat flowed mainly around the event they had all just witnessed, some members of the local press appeared and they did various reports. Graham Brookland, the community fund raiser for the Phyllis Tuckwell Hospice appeared and Steve Puddick handed over a cheque in excess of £4500 to the hospice. Please can I advise any of the reader’s kindly that the management of Genesis and the staff of The Farm studios do not appreciate unexpected visitors and if you trespass into the studio you may end up with a less than positive experience/reminder of your visit. Since this experience Genesis have released all of these releases in the form of Double albums either SACD/CD and DVD, As well as in a collectors Box set with the years 1976 to 1982 (Blue) 1983 to 1998 (Red) and finally the period of 1970 to 1975 (Green). Head on over to the Boxset Reviews to find them.